The varsity softball team upped their record to 8 and 3 by defeating Mt. Notre Dame yesterday 8-1. 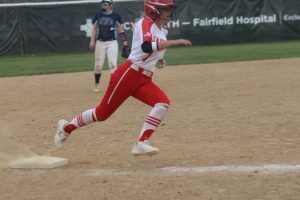 Junior Maiah Hodge recorded her first home run – an in the park hit where she circled the bases on her speed. Seniors Jordan Shotwell went 3 for 4 with a double and 2 RBI’s, Maddie Schaeffer 2 for 4, Natalie Elliott 2 for 4 with 2 RBI’s and Lindsey Mitchell took the win in the circle with 6 strikeouts. Freshman Cara Stacy went 2 for 3 with 2 RBI’s. The team travels to Mason today and Middletown on Monday.